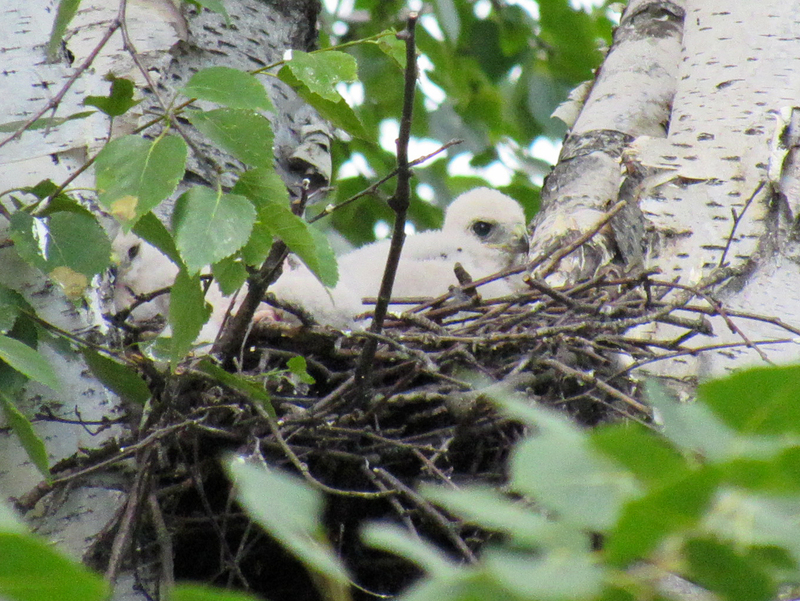 I was pretty excited about seeing white fluff in the nest on June 27th, so I visited again two days later with hopes of glimpsing wee beaks and eyes. My photo adventure started at 12:41 PM and my first photo was not promising. White fluff??? I watched for two minutes, but no wee hawks appeared. Another cute creature caught my attention though. 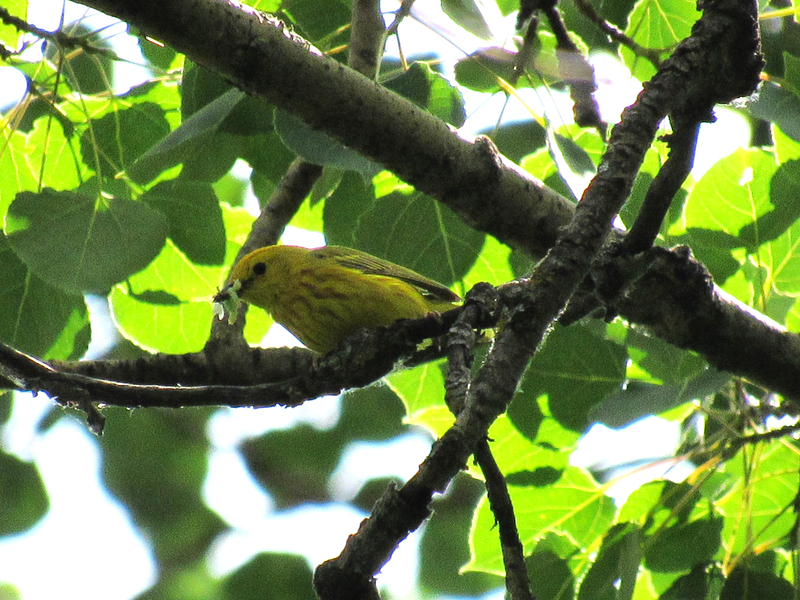 A nearby yellow warbler had a beak full of little green caterpillars. Clearly, he had wee ones too. 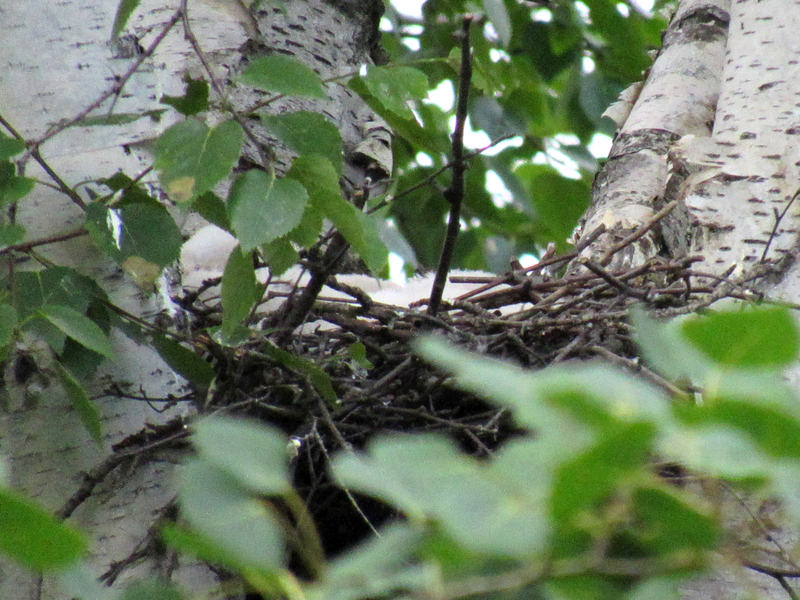 Two minutes later, I checked on the hawks’ nest again. Yippee! 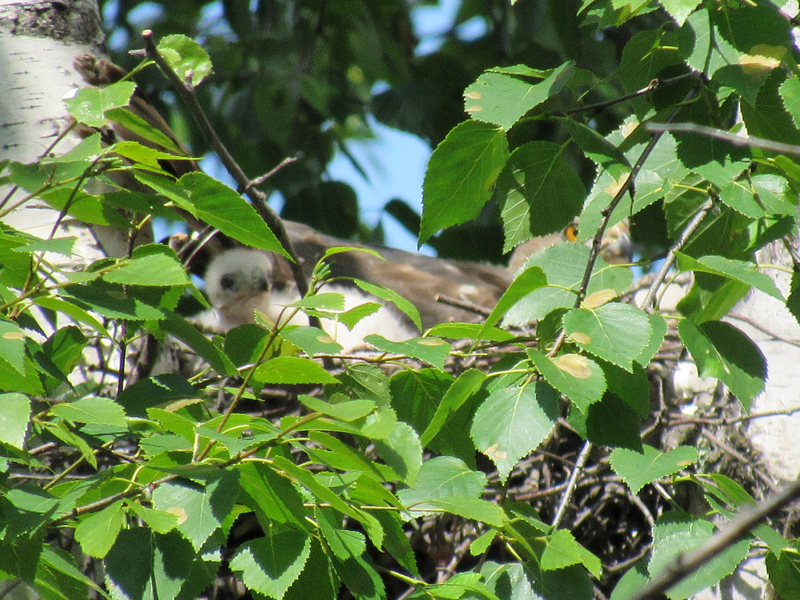 Alas, I tried and tried but I couldn’t get my camera to focus on the birds (I’ve since figured out how to use manual focus, which is handy for creatures that don’t move for a while and are behind lots of little branches). 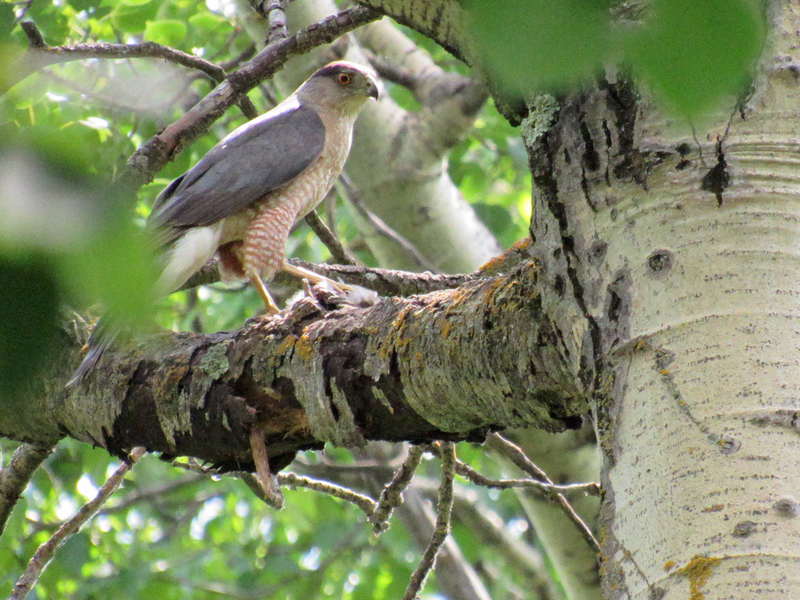 When hawk-focus finally happened, the little white head was gone and 10 more in-focus minutes yielded no little black eyes. 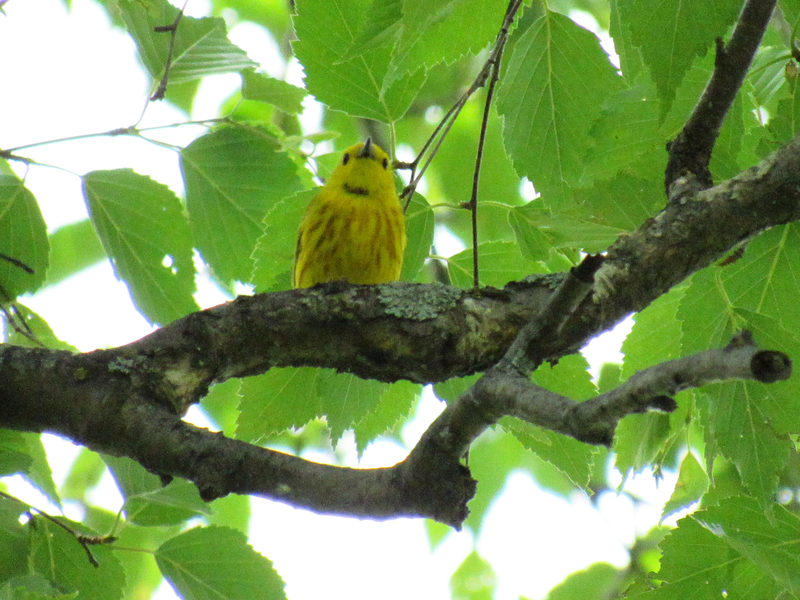 Luckily, Mr. Yellow was still in the neighbourhood and he let me follow him around for a while. 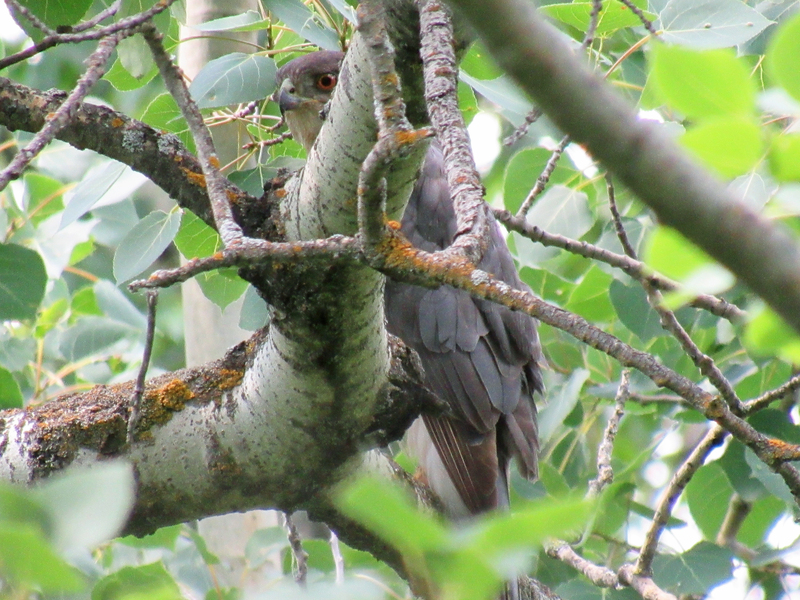 As I walked down the trail away from the nest, an adult Cooper’s Hawk flew into the area. I looked into the forest, hoping to find its perch. Papa Cooper! And he had a snack under one foot. It was now 1:08 PM, 12 minutes since I walked away from the nest, and I was curious to see if dad would deliver the snack to his family. So I headed back to the nest. Squee! And then Mama appeared! 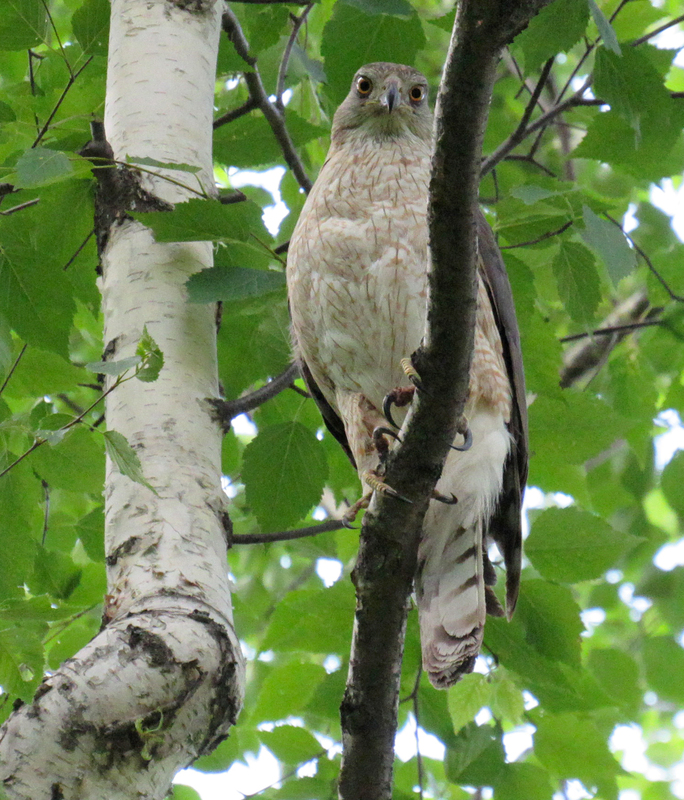 She flew over my head onto a nearby perch and cursed at me in her language. Her body language and the pitch and amplitude of her voice clearly said, “Back off!” I walked a few meters away and stopped. 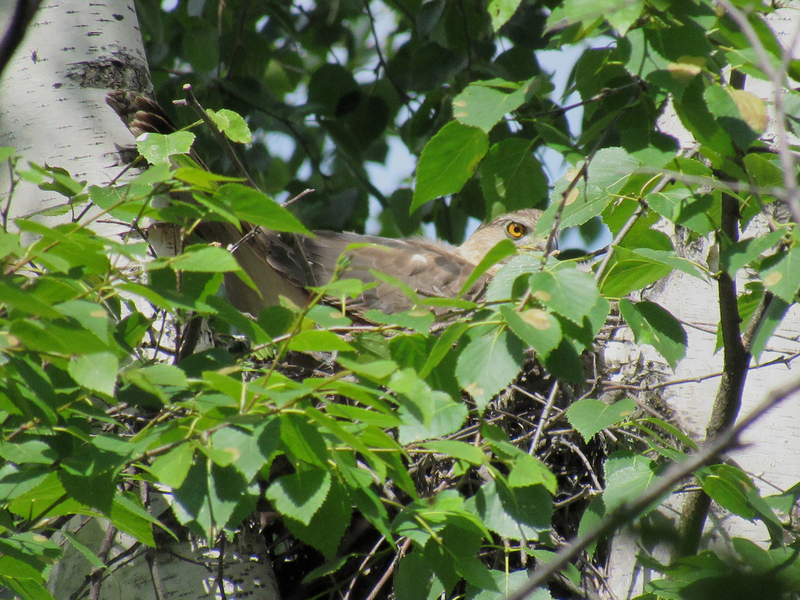 Mama soon appeared in a nearby tree to keep an eye on me. Occasionally, she gave me a two-eye-stare. Intense! At 1:35 PM, I saw Papa again. Three minutes later, I spotted Mama with a snack. Did she catch it or did Papa bring it? I’ve read and heard of the latter occurring, so maybe I missed the exchange and there is a hidden prey in my photo of Mr. Cooper. You can click on the photos below to see larger versions. If you are squeamish and not into bird-sushi, feel free to quickly scroll past the small photos. 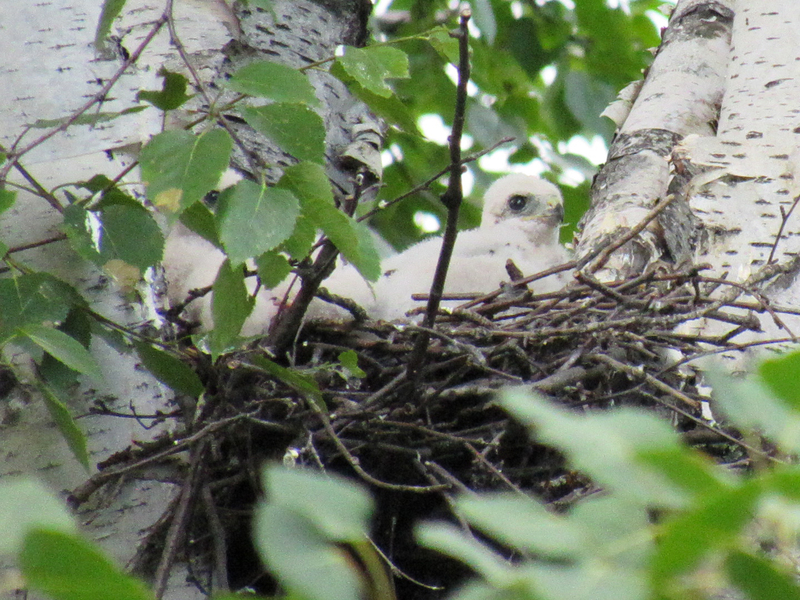 At 13:48 PM, I returned to the nest and saw a flat blanket of white down. 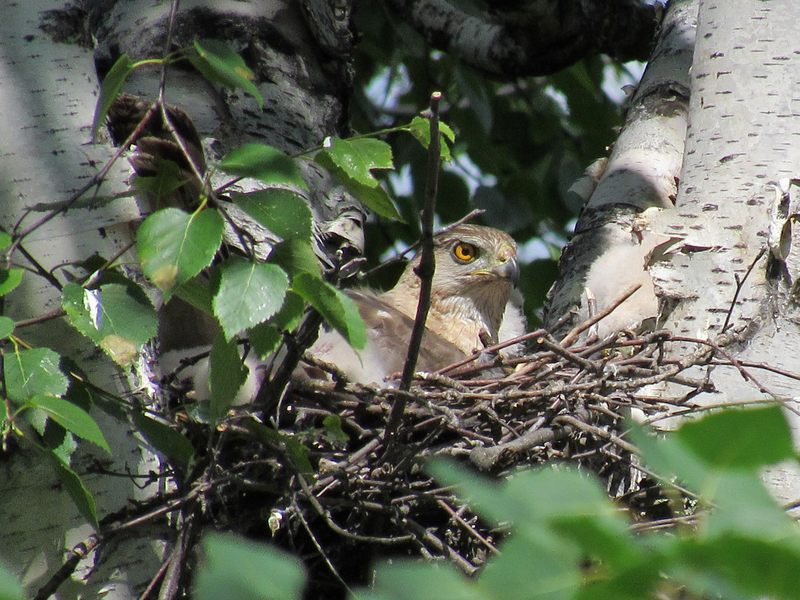 A minute later, Mama was staring at me from a nearby perch. But I didn’t heed her warning right away. I liked her pose and her intense attitude and was hoping I could get an awesome photo of her. She didn’t oblige. I had been looking forward to this sequel, Myriam. How exciting that you found the Cooper’s chicks. I have been struggling with the same problem of not being able to focus on what I want to when my camera’s setting is on automatic, but I have yet to figure out the manual setting! My first Northern Saw-whet Owl convinced me to try manual focus. 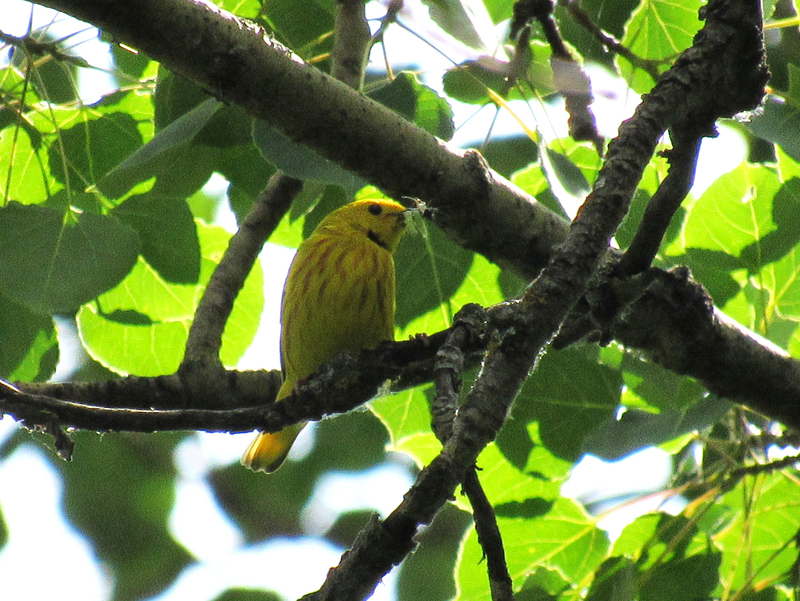 Even though I was looking at it for a few minutes from only about 3 meters away, it didn’t budge from its branch. 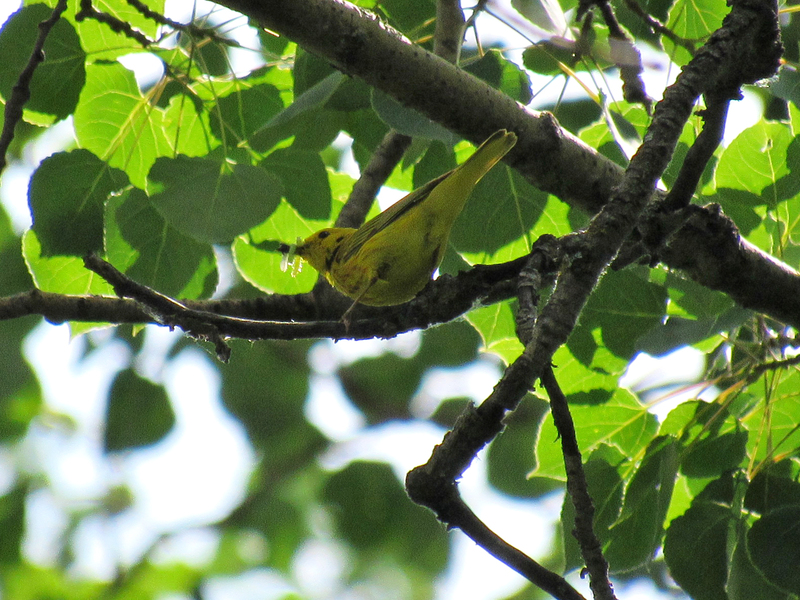 Since all the little branches in the way made auto-focus impossible, I decided to fiddle with manual focus. 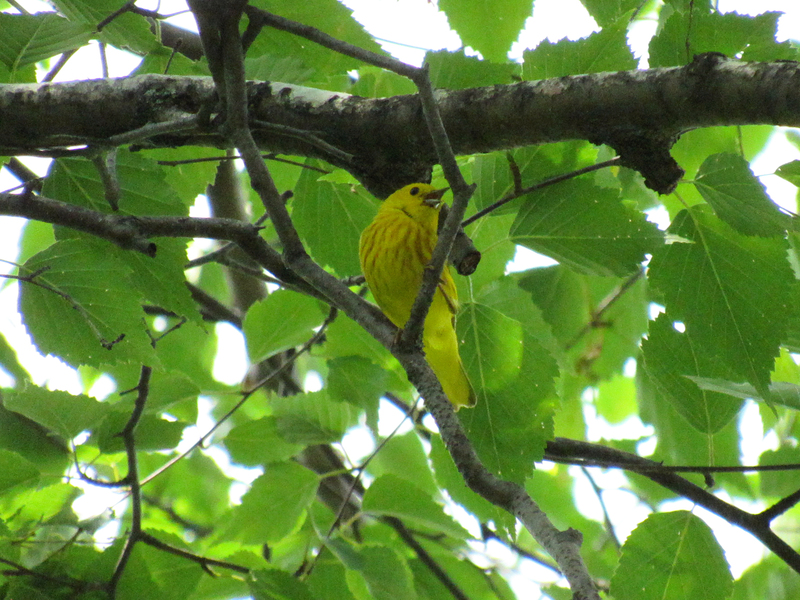 I couldn’t get very sharp focus, I still can’t, but it was much better than a blur. With my camera, I get a smaller rectangle which appears in the centre of my LCD display (my camera doesn’t have a view finder). I then have to press the up and down arrows until my desired subject becomes clear in the small rectangle. Not very precise and the visibility in the small rectangle is not great. I’m guessing there are cameras with much better manual focus. Too many rodents in your neighbourhood? 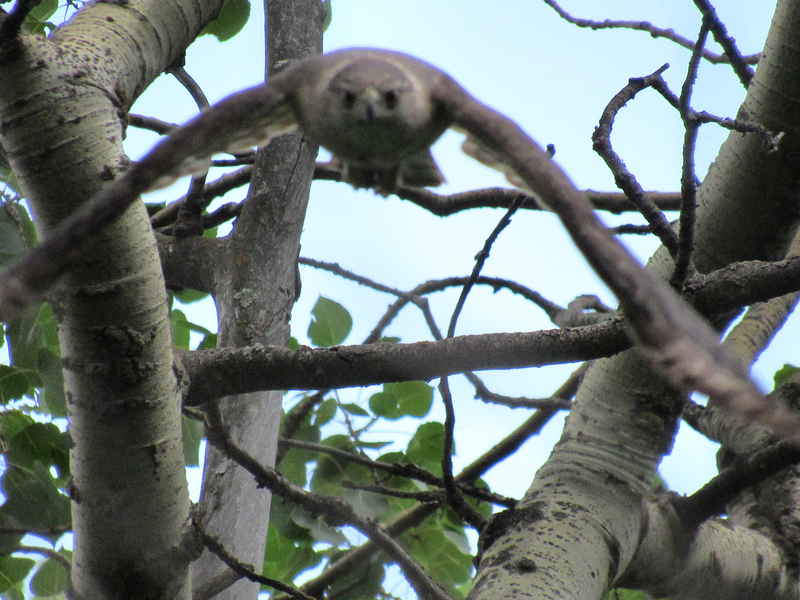 I once saw an immature Cooper’s swoop down on a little mouse that was crossing a trail, but it missed. I’ve only seen three Cooper’s with prey. This one with the bird, another flying with a little bird that was making sad sounds and another with a squirrel. So that’s 2:1 for birds and rodents in my experience. Not statistically significant though ;-). Oh how exciting!!! The chicks are adorable. She sure did Buzz you didn’t she. 🙂 I’m looking forward to the follow up post. Yeah! Thanks for sharing the excitement :-). She was very protective! 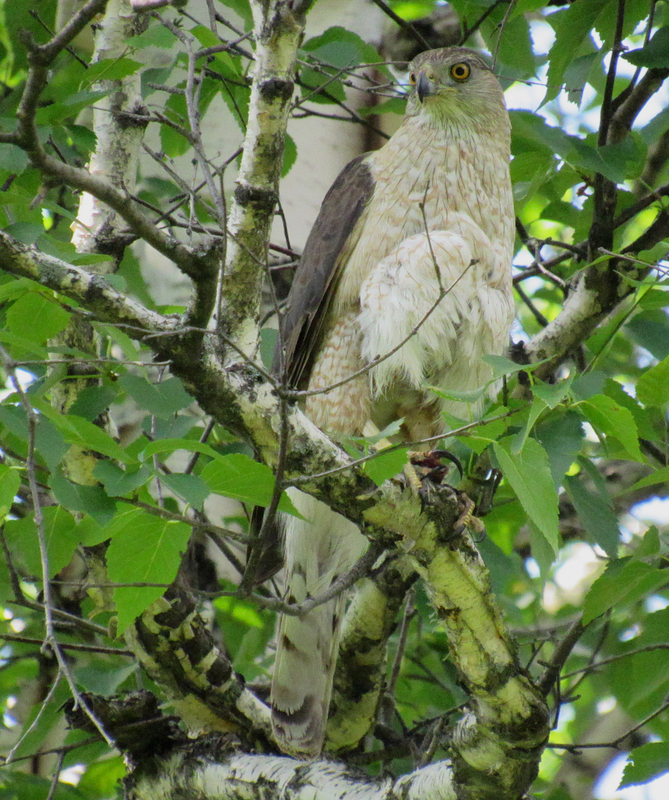 Protective hawks are way scarier than protective magpies, but at least they don’t almost burst my eardrums. Very fascinating! You’re so lucky to see the Cooper’s kids in a wild like that. Thank you for sharing. Thanks for enjoying the story and photos :-). I felt really lucky to see the little ones – my first and only time so far. 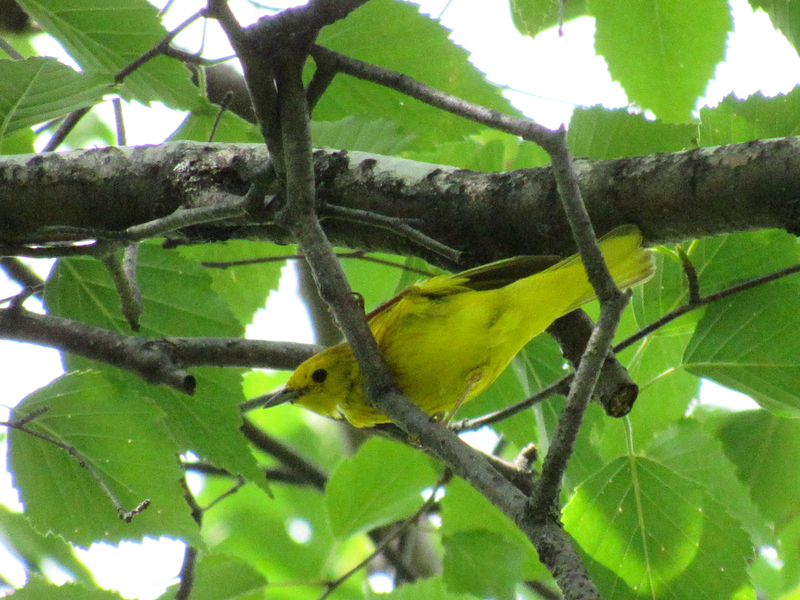 Good for you, it must have been hard work, tracking the hawks & warblers, but worth it…until that last lunge! So exciting! Just think, by now those wee ones are out ferociously hunting on their own. That lunge from mama~wow. Recently I was on the trail with my puppy…did I already tell you about this? And I looked up in time to see a redtail swooping down for lunch, only belatedly noting the leash. Boy was he cross. You know, if I look your photos I feel like I am going to buy myself camera right now. I spend too much time indoors. Wonderful blog and loved the images as well. Thanks so much for your kind words, Debbie :-). I loved, loved, loved, loved your post on burrowing owls. They are so cute and comical (they look a bit like cartoon characters), and I enjoyed the variety of action you captured. What a thrill to see this story unfold! These shots are just stunning. Thanks, Carol! 🙂 I was happy to find that the Coopers came back to the same nest this year. Mrs. Cooper is just as fierce!